Carotino Margarine is formulated to enhance the texture and mouth feel of baked products. Besides conveying a delicious butter flavor Carotino Margarine adds nutritional value to products with its natural blend of Carotenes (pro-Vitamin A), Tocopherols and Tocotrienols (Vitamin E). Carotino Shortening replaces butter or normal yellow shortening without the need to change existing product formulations. Nonetheless your product will look highly appealing due to the resultant attractive golden colour. 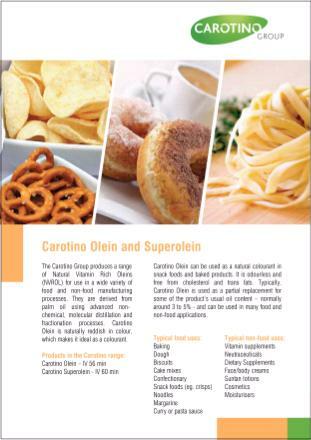 Carotino Shortening enhances the health and nutritional value of baked products with natural carotenes (pro-Vitamin A), tocopherols and tocotrienols (Vitamin E). Carotino Butter Oil Substitute (BOS) is specially formulated from red palm oil and high quality ingredients including a delectable butter flavor. It is ideally suited for making breads, cookies, crackers, pastries, cakes and other baking products Carotino BOS is a healthy and cost-effective alternative to other shortenings and dairy butter. Nutritional deficiencies pose a major problem in developing countries and this so-called ‘hidden hunger’ is highly detrimental to the health of the population, particularly children. Vitamin A deficiency is a particular problem as it impacts general health, vision, immunity, growth, foetal development and cognitive and mental performance. Carotino red palm fruit oil is considered to be the world’s richest plant source of natural carotenes (pro-Vitamin A) and natural tocotrienols. The need for fortified food products to combat Vitamin A deficiencies prompted the South African Medical Research Council (MRC) to scientifically evaluate the use of red palm fruit oil in snack foods. The Nutritional Intervention Research Unit (NIRU) of the South African MRC joined forces with Carotino to carry out a long term nutritional intervention study to prove the efficacy of Carotino red palm fruit oil baked biscuits. This landmark study has been well documented in the UN Food and Nutrition Bulletin. Carotino and the Malaysian Palm Oil Council (MPOC) joined forces in a recent community development project in South Africa to develop a self sustaining bakery model to produce and sell cost-effective carotene-rich muffins to local school children. The aim was to combat Vitamin A deficiency in children and adults as well as giving the people running individual bakeries valuable life and business skills and generating funds for disadvantaged schools. Carotino produces a range of Natural Vitamin Rich Oils and Oleins for use in a wide variety of food manufacturing processes. Carotino Oils and Oleins are naturally reddish in colour and they are normally used as oil and fat medium. In addition, they can also be used as natural colourant in making foods appetising by imparting a natural golden appealing appearance without having to add any artificial colourant. By varying the quantity of natural carotenes in the oil or olein, the colour of the finished foods such as potato crisps, french fries, pastas, noodles, snacks, biscuits, confectionery and other baked products can vary from light yellow to golden yellow colour. The use of Palm Fruit Oil as a form of cooking and frying oil has shown to have an excellent oxidative stability as compared with other vegetable oils. Frying oil must withstand high temperatures without breaking down or polymerising quickly and without oxidising and turning rancid. Polyunsaturated oils have to be partially hydrogenated to render them to be more stable for deep-frying. Where as, Palm Fruit Oil has good oxidative stability due to the presence of high level of natural antioxidants (tocopherols, tocotrienols and carotenoids) and balanced level of saturated and unsaturated fatty acids. Cooking using Palm Fruit Oil will not produce excessive smoking, spattering, foaming and forms less gummy residues in the pans after cooking. Use of Palm Fruit Oil in frying deteriorates less rapidly than many other vegetable oils. CAROFRY is made from the finest quality Palm Fruit Oil and when used as a frying medium imparts a golden yellow color to the foods, making them more appetising and palatable. Foods cooked in CAROFRY become healthier as they are fortified with natural carotenes (pro-Vitamin A) and Vitamin E which are anti-oxidants. and cooked in other vegetable oils (right portion).